Businesses must become agile and provide differentiated service as customer demands and expectations change. Moving beyond simple phone transactions, customers are taking matters into their own hands and turning to their peers, the web and social media to find answers. 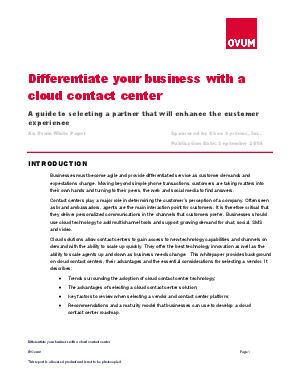 Contact centers play a major role in determining the customer’s perception of a company. Often seen as brand ambassadors, agents are the main interaction point for customers. It is therefore critical that they deliver personalized communications in the channels that customers prefer. Businesses should use cloud technology to add multichannel tools and support growing demand for chat, social, SMS and video.